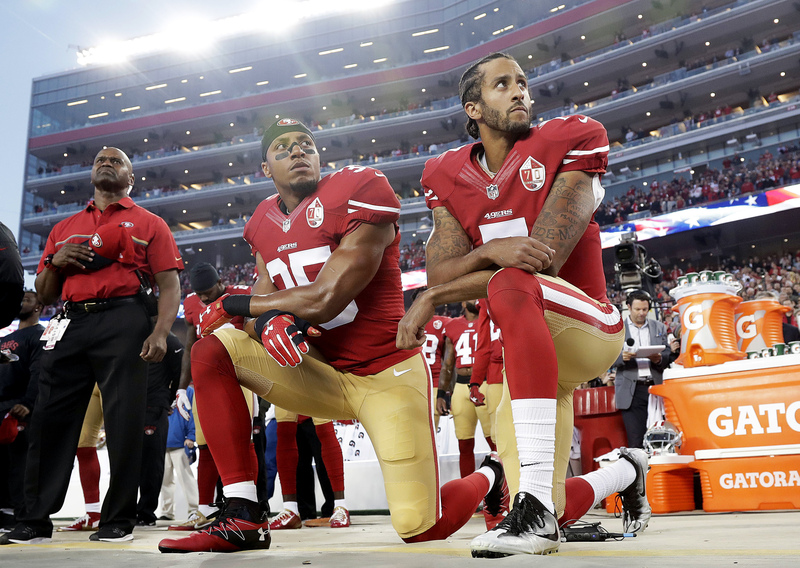 The Carolina Panthers announced Thursday that they have signed free agent Eric Reid, the veteran safety who had joined Colin Kaepernick in kneeling during the national anthem when both played for the San Francisco 49ers. Reid, 26, played five seasons in San Francisco and started 69 of the 70 games in which he was active, making the Pro Bowl and being named first-team all-pro as a rookie in 2013. But despite his track record, no team signed him as a free agent in the offseason after his contract expired, leading him to join Kaepernick in filing a grievance against the NFL, alleging collusion to keep him out of the NFL by the league’s owners. As explained by Sports Illustrated sports-law expert Michael McCann earlier this year, the Panthers signing Reid does not necessarily mean that he’s ending his grievance against the league, though he’s within his rights to do so. “Our union is proud to stand with one of its strongest player leaders and we congratulate Eric for making it back to doing the job he loves,” Eric Winston, president of the NFL Players Association, said in a quote posted on Twitter. The 2-1 Panthers were in need of help in the defensive backfield after starting safety Da’Norris Searcy suffered his second concussion in five weeks and was placed on injured reserve. They had four interceptions in a win over the Cincinnati Bengals on Sunday, but also surrendered 352 passing yards and two touchdown passes to quarterback Andy Dalton. One week earlier, Atlanta Falcons quarterback Matt Ryan completed 23 of 28 passes for 272 yards and two touchdowns in a seven-point Carolina loss. On Tuesday, Carolina wide receiver Torrey Smith lobbied for the team to sign Reid while also saying that Kaepernick deserved a spot on an NFL roster. “Eric Reid is a Pro-Bowl caliber safety, 26 years old with a first-round pedigree,” Smith said, per the Charlotte Observer. “And he’s one of the best men that I know. I know that teams obviously have to be interested in him, and honestly, with our injuries I hope he ends up here. Reid said in March that he wouldn’t take a knee during the national anthem when he returned to the field, and would instead raise awareness for social justice causes in other ways. The Panthers recently were purchased by billionaire businessman David Tepper, who in September announced his support for NFL players who were raising awareness of social issues, and criticized those who would question their patriotism. According to the NFL Network’s Jim Trotter, the 49ers also were interested in signing their former player, perhaps to a long-term deal. The Panthers, according to Trotter, did not ask Reid whether he planned on continuing his protests. “The signing was strictly a ‘football decision'. They believe he’s a good football player who can help them win,” Trotter wrote on Twitter. Matt Bonesteel spent the first 17 years of his Washington Post career writing and editing. In 2014, Bonesteel pivoted from the newspaper to online and now he blogs for the Early Lead and other Web-based products owned by The Post.